Oak-hickory and oak forests and forest edges, sometimes in moister forests and thickets; occasionally in prairie remnants. Frequently confused with the much more common Zizia aurea, which usually grows in wetter, sunnier places. When a sessile bisexual flower is evident in the center of an umbellet, the plant is clearly Zizia; however, this is not always easily seen in very young inflorescences, or if the central flowers are staminate, as they are in some umbellets of Zizia and all umbellets of Thaspium. The prominent broad wings on all sides of the fruit in Thaspium become evident (more than mere ribs) in even young fruit (at a stage when it is nearly smooth in Zizia). 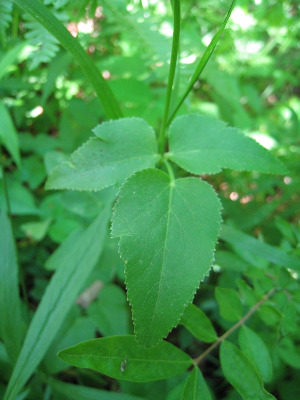 A comparative character, difficult to describe, is that the teeth on the leaflets of T. trifoliatum are obtuse with a prominently thickened pale border and callous tip, while in Zizia the teeth tend to be acute with less well-developed border and callus. This species closely resembles the rare Zizia aptera, also of dry ground, but the petiolar sheaths are narrower at any given level on the stem; sheaths on midcauline leaves, for example, are less than 5 mm broad in Thaspium trifoliatum and more than 5 mm broad in Z. aptera. MICHIGAN FLORA ONLINE. A. A. Reznicek, E. G. Voss, & B. S. Walters. February 2011. University of Michigan. Web. 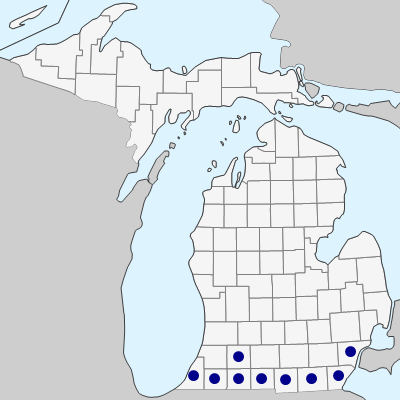 April 26, 2019. https://michiganflora.net/species.aspx?id=146.